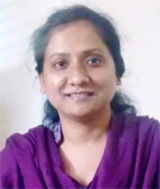 Ph.D. awarded in August 2012 on topic “Synthesis, characterization and analytical applications of certain polysulfobetaines and polycarbobetaines" in Analytical Chemistry, from Department of Chemistry, Banaras Hindu University, Varanasi, India. Worked as a DST- Junior Research Fellow from January 01, 2009 – January 01, 2011. Worked as a DST-Senior Research Fellow from January 02, 2011- September 30, 2011. Worked as Postdoctoral Fellow in Department of Chemistry, BHU, Varanasi from January 01, 2012- August 31, 2012. Worked as Assistant Professor in Department of Chemistry, ITM University Gwalior, M.P. from September 10, 2012- April 15, 2013. Worked as Postdoctoral Fellow in Department of Chemistry IIT Bombay, Powai, Mumbai from May 6, 2013- April 01, 2014. Currently working as Assistant Professor, Department of Chemistry, Ch. Charan Singh University, Meerut, U.P from 3 March, 2015- till date. Qualified CSIR Research Associate Fellowship from June 2013-March 2014. Received DST and INSA Travel Grant-2011 for presenting research paper in International Conference held at France. Assistant Warden of Durga Bhabhi Girls Hostel at Ch. Charan Singh University, Meerut from 3 October 2016-30 April 2017. Assistant Warden of Durga Bhabhi Girls Hostel at Ch. Charan Singh University, Meerut from 27 October 2017-till date. Nazia Tarannum, Meenakshi Shingh and Anil Kumar Yadav. “Antibacterial activity, thermal stability and ab-initio study of copolymer containing sulfobetaine and carboxybetaine groups.” Mater Res Express 4 (10) (2017) 105304. Nazia Tarannum, Ranu Agrawal, Shivani Rana, Priyanka Gupta, Amit Upadhyay and Rakesh Kumar Soni. “A Pilot Study on Assessment of Lead in Umbilical Cord Blood Serum and its Correlation with Maternal Socio-demographic and Epidemiological Characteristics” Women & Health (2017) under Review. Tuhina Tiwari, Nazia Tarannum, Maninder Kumar and Neelam Srivastava.“Electrical Transport Properties of NaI doped Poly(N-phenyl-N'iminopentyl) imminium propanesulfonate.” Transvylvanian Reviews (2017) under Review. Participated in National Symposium on Recent Advances in Toxicological Studies Molecular and Physiological Aspects, during 27-28 February, 2008 at Banaras Hindu University, Varanasi, India. Poster Presentation on paper entitled “Synthesis, characterization and swelling property of polycarboxybetaine gel.” at National Conference On Application of Material Science In The Service Of The Society, during 12-13 September, 2009 at C.M.P Degree College, University of Allahabad, Allahabad, India. Oral Presentation on paper entitled “Sulphobetaine and NaSCN: A new zwitterionic polymer electrolyte system.” at 8th National Conference on Solid State Ionics: Materials for Novel Devices, during 7- 9 December, 2009 at Dr. Hari Singh Gour Univ. Sagar, India. Poster Presentation on paper etitled “Synthesis and application of L-aspartic acid imprinted polymer.” at 3rd National Symposium on Analytical Sciences (NSAS) on Recent Advances in Analytical Sciences, during 12-14 April, 2010 at Himachal Pradesh Univ., Summer Hills, Shimla, India. Poster Presentation of paper entitled “Synthesis, Characterization and photoluminescence study of polysulfobetaine polyelectrolyte based on Schiff base chemistry.” at National Symposium on Emerging Trends in Chemical Sciences, during 19-20 February, 2011 at Banaras Hindu University, Varanasi, India. Poster presentation of paper entitled “Computational investigation and synthesis of a zwitterionic imprinted material for selective recognition and detection of L-aspartic acid.” at Second International Symposium on Frontiers in Polymer Science (Elseveir) during 29-31 May 2011, Centre de Congrès, Lyon, France. Poster presentation of paper entitled “Selective Recognition and Detection of Zwitterionic Drug ‘Baclofen’ by Surface Molecular Imprinting Technique” at Kathmandu Symposia on Advanced Materials (IUPAC) during 9-12 May 2012, Tribhuvan University, Kathmandu, Nepal. Participated in 16th CRSI National Symposium in Chemistry during 7-9 February, 2014 at IIT Bombay, Mumbai India. Participated in Workshop on Role of Internal Quality Assurance Cell in enhancement of quality of Higher Education on 23 March, 2015 at CCS University, Meerut, India. Poster Presentation “Silver nanoparticle based water compatible molecular imprinted polymer for artificial recognition of mesalmine” at Applied Nanoscience and Nanotechnology International Conference (PremC) during 5-7 November 2015, Paris, France. Participated in Symposium & Workshop Statistical Methods in Computational Biology during 28-29 December, 2007 at Banaras Hindu University, Varanasi, India. Participated in BHU Summer School of Computing during 07-19 April, 2008 at Banaras Hindu University, Varanasi, India. Participated in National Symposium – workshop on X-Ray Crystallography during 08-09 March, 2010 at Banaras Hindu University, Varanasi, India. Participated in Workshop of Single Crystal XRD (UGC Networking Program) during 21 November-4 December, 2010 at Hyderabad Central University, Hyderabad, A.P. India. Participated in the Workshop on Electronic Structure Calculations and Applications during 26-27 March, 2011 at Mahila Mahavidyalaya, Physics Department, Banaras Hindu University, Varanasi, India. Certified Course (DAAD) for Preliminary German Language from Oct 2013 to March 2014 at IIT Bombay, Powai, Mumbai, India. Completed Certified Course on “Schematic Analysis of NDPS”organized by GFSU Gujrat India from 01 July -15 July 2014. Orientation Course Completed at Jamia Millia Islamia University, New Delhi from 19 July-16 August, 2016. Delivered Invited Lecture entitled “Hands on ChemDraw Tools”on 11 Nov, 2017 at Department of Chemistry, SSV College, Hapur, Uttar Pradesh, India sponsored by Commission for Scientific & Technical Terminology. Worked as a Joint Secretary in organizing the Workshop on Technology Development and Transfer to Industry- Challenges & Opportunities Organized by Industry Consultancy Cell on 31 March, 2015 at Chaudhary Charan Singh Univ., Meerut, India. · Workshop on Chem-draw software was organized and conducted for M.Sc students on 20/5/15 and 20/5/2016 at Department of Chemistry, Chaudhary Charan Singh Univ., Meerut, India. Working as a Principal Investigator in UGC-Start-Up grant project “Lysophosphatidic acid imprinted β-cyclodextrin polymer as an artificial biomarker for ovarian cancer” worth Rs 6,00,000/- granted in November 2015. Working as a Principal Investigator in DST-RFBR International Coperative Collaboration with Russia “Regularities of low molecular weight analytes detection by natural and synthetic receptors: Comparative analysis and application in the development of systems for antibiotics detection” worth Rs 13,98,200/- granted in June 2017. Working as a Co-Investigator and Indian Collaborator in Indo-UK Project with Ulster University, UK under Global Challenges Research Fund (GCRF) Ulster University Pump-priming Application 2017 “Safe motherhood intervention app” worth Rs 20,00,000/- granted in October 2017.